This mid-1960s image shows a rank of shops on the west side of The Square, opposite the clock tower, which survived the blitz and look remarkably unchanged today. A lost telephone box and belisha beacon represent pretty much the only substantial changes in the foreground of the image. Parking was still permitted along Warwick Road back in those days, of course. Directory listings from the 1939 Kelly’s Directory quoted on Robin Leach’s WWII website list these premises as (left to right) Reginald Victor Dickenson, ironmonger, H H Railton Boot & Shoe and Wm Ed Taylor. 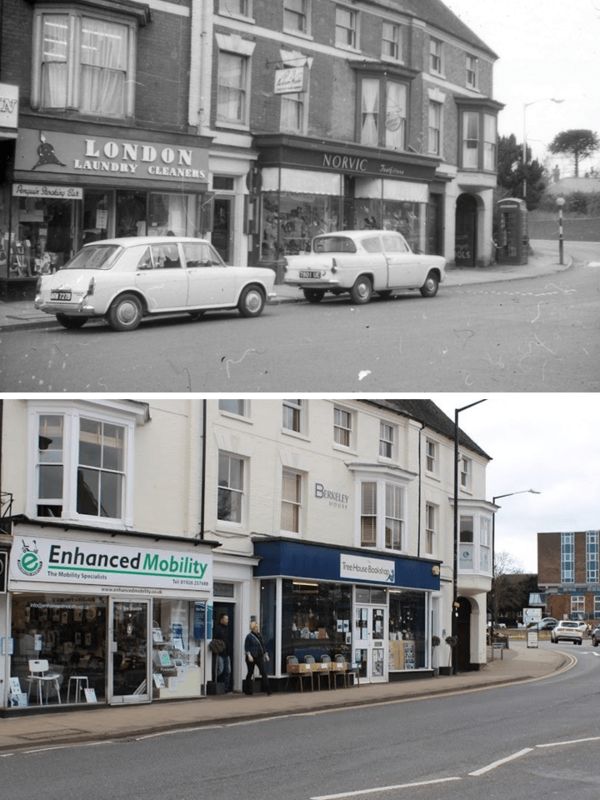 By the mid-1960s they had become (left to right) a dry cleaners and Norvic Shoe and Boot Company, with what looks to be a sign for a ‘Tools’ shop through the archway. A pre-War image on the Our Warwickshire website shows the houses in the distance on Smalley Place, which survived the parachute mine of November 1940 but do not exist today. Those plots are now part of the Holiday Inn site, formerly the De Montfort Hotel. From old maps around the turn of the 20th century, it is possible to make out a line of workshop type outbuildings that would have been accessed through the archway beneath the bay window. An article in Kenilworth History 2017 relates to the recent discovery by workmen of a very old Kenilworth sandstone wall ‘of considerable antiquity’ inside a shop called Over The Moon, at 14 The Square just out of shot to the left. The plots occupied for many of these properties date from the very earliest years after the establishment of the ‘castle end’ borough in the 13th Century.